The Limited Edition model from the Mizuno JPX collection is a revolutionary design that uses the key elements of Power and Speed. 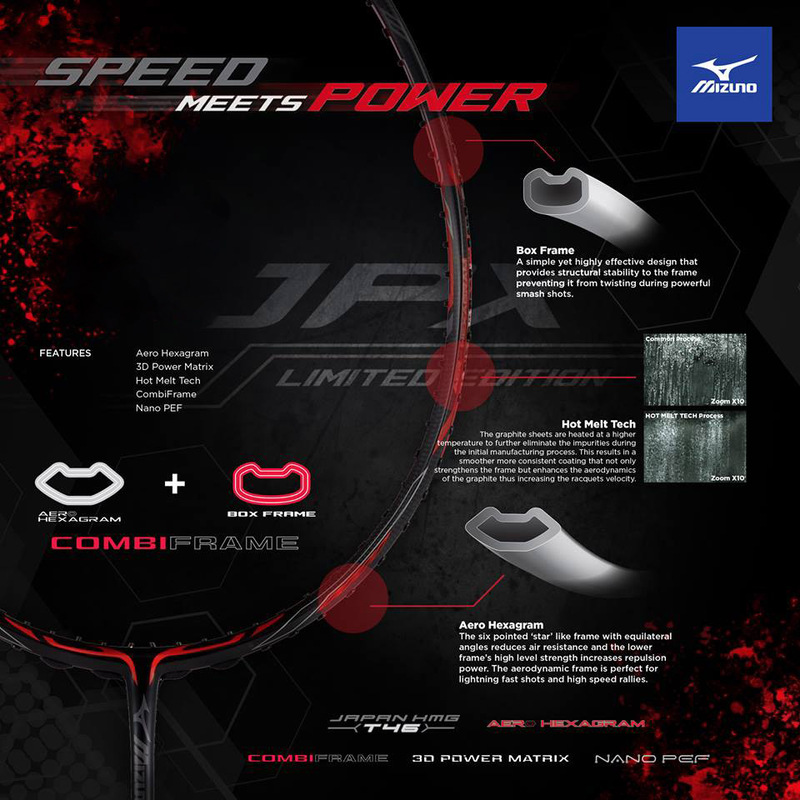 Due to the CombiFrame Design, the initial flexing of the frame generates a greater head speed, whilst the tenacity of the 3D Power Matrix and the Box Frame Design at the top of the frame generates Power producing a massive amount of energy that converts the racquet into the ultimate Speed and Power weapon. Mizuno JPX Limited Edition having a Stiff Flex, and 3D Graphite End cap. The unique manufacturing process of interlinking and overlapping composite fibers that are woven over the frame creates a high resilient design. This seamless construction evenly dissipates the pressure that a racquet receives during aggressive play protects the underlying structure of the frame. The CombiFrame infuses two distinctive features resulting in a uniquely versatile frame. Contouring from an Aero Hexagram frame starting at the bridge to a Box Frame from the middle to the top of the racquet. This combination generates highly explosive head speed, extreme power, and unswerving control.